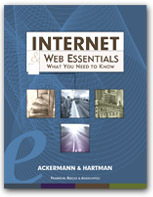 The Internet and the Web have been designed so that its possible to be an information provider as well as a consumer. The protocols that support the Internet give all nodes equal status, Web browsers with graphical interfaces are commonly used, and the means for preparing Web pages are not difficult. This has led to a large amount of information available in the form of Web pages, and the expectation that virtually every organization or business has a Web presence. These factors make it important that you understand the technical and design issues involved in creating, providing, and evaluating Web pages and Web sites. The source for a Web page is a plain text file that contains HTML tags. A browser, acting as a client, requests the source for a Web page from a computer that acts as a Web server. When the file is retrieved, the browser displays it in its window. In order to make information available on the Web, then, it is necessary to place the source on a Web server. Designing a Web page involves several facets. Most importantly you need to identify the purpose of the page. Other items to consider include being aware of the technical considerations involved in displaying a Web page, identifying the audience, looking at other Web pages with a similar purpose, identifying the content, and coming up with an appropriate design. The Web page ought to be tested with more than one computer system and browser. A Web site is a collection of Web pages with a common theme or purpose. In designing a Web site you need to come up with a scheme for presenting and arranging the information. The presentation ought to support the fact that the information is related, and the arrangement often should mirror the logical structure of the information. A Web page can be written using a simple text editor, but there are other types of editors or ways to create a Web page. These include HTML editorstext editors that include easy ways to insert HTML tags into a file, conversion toolstools that convert a file from one format such as a spreadsheet or word-processing document to HTML, services that create a Web page out of information you provide, and visual editorseditors that provide tools to produce a Web page without you having to insert HTML. Putting information on the Web means taking your source files and placing them on a Web server. Some Internet service providers, Web-based services, and organizations provide space for Web pages. If these dont suit your needs, you can pay a monthly fee to a Web presence providera company that provides space for and tools to create and maintain a Web site. FTP is often used to transfer a source file to a Web server. Once a Web page or site is on a Web server youll want to make it possible for other people to find it easily. There are several services that will submit the URL to various search engines and directories. Its also possible to advertise your site on the Web either through paid advertisements or so-called link exchanges. Be sure to read tips available on the Web about ways to announce your Web site and to get it noticed. Palletes that show the colors that can be safely used with popular browsers. Some resources from the Web that serve as guides to effective design. Information architecture deals with the structure of information in a usable form. Resources to use to find statistics dealing with the use and growth of the Internet. Collections of tools to help you create Web pages.